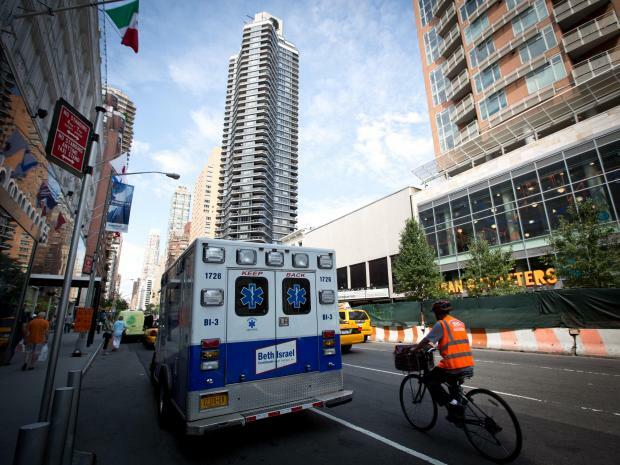 UPPER EAST SIDE — A bicyclist struck by a car at the intersection of Third Avenue and East 59th Street on Tuesday afternoon was sent to the hospital with minor injuries, FDNY officials said. The cyclist, believed to be a man in his 20s, was injured just before 3:15 p.m. and taken to New York-Presbyterian Hospital/Weill Cornell Medical Center, fire officials said. The driver of the Mitsubishi Galant, who remained on the scene, claimed the cyclist cut him off. The driver said he was traveling east on East 59th Street and was heading into the intersection at Third Avenue when the cyclist cut in front of him. "I was on the left lane. He was in the middle lane in front of a truck,” said Kenny, 30, of Astoria, declining to give his last name. "The truck blocked my view when he [the bicyclist] suddenly tried to turn left." "I tried to avoid but there were people on the sidewalk. I hit the brake — that’s all I could do," Kenny said. "It hit the metal pedal of the bicycle." A crossing guard nearby confirmed that the bicycle cut in the lane of the Mitsubishi. "He was OK as far I as I see," said Kelly. "He was conscious."